We are often our worst enemy. Plagued with uncertainty, we question the possibility of what lies beyond a threshold we have yet to cross or even imagine. What stops us is usually the overblown fear of some imagined beast. If we are honest with ourselves, we realize our perspective shapes that beast. On my bad days, I forget perspective is something I shape and control. I may not always want to realize that fact, but such ignorance doesn’t change the reality. You get lemons or you make lemonade. Take your pick. I “lost” something today that I valued very much. I was happy for the person involved; in fact, I knew it was destined to happen. I had been fortunate for some time that it hadn’t happened sooner. This person brought many blessings to my journey. Once sequestered, I cried at first, beset with doubt, asking what was I going to do? But after the third deep breath, I stepped forward through the door of change even if my tears were blurring my vision. I couldn’t quite see all the landscape of beyond, but with right attitude, I knew I could help shape what I saw, and in turn, shape how I would act. Change is to be expected, creating new paths and experiences. The sense of loss about what we leave behind is also possible. Grief is a natural and human response when we feel change’s first thrust. But, if we remember that endings bring with them new beginnings, we also can transform our doubt into hope and our hope into action. The painting positioned with this post was completed just before I became aware of today’s change. The painting haunted me for lots of reasons. It was a good haunting, because beyond the door were flowers and running water and a vista of green hills. 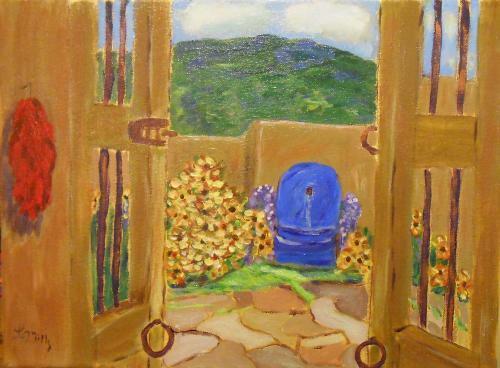 There was no ready answer awaiting me beyond that door telling me what to do next, but I was struck by the sense of sanctuary the painting brought me and the knowledge that with each stroke I could create any kind of scene I wanted. Life is no different. Every day we have the chance to paint beauty or paint turmoil. It doesn’t mean we won’t fall or fail, but if we never open the door, we’ll never learn what is possible. Be an opener of doors, says Emerson. I add: Paint to your heart’s content.